Kidd tries to convince Herrmann to invest in a new ice maker. Herrmann and Dawson rescue a woman and her kid from an apartment fire. The woman is found with a needle in her arm. Severide talks to Boden about new masks. Boden talks to the chief, but he says they don't have the budget for it. Cruz confronts Otis over not getting the blood test. The boy, Louie, is a foster kid and is picked up by social services. Dawson goes back to the apartment to find his blanket and brings it to him. Cruz brings in Otis' grandmother to convince him to get the blood test. Brett and Jimmy treat a man who is foaming at the mouth from drinking a bottle of soy sauce. Severide goes to Casey for help for the masks. Kidd convinces Herrmann to go for the ice machine with Severide's help. Otis has a platelet disorder. Dr. Halstead tells him he can't return to work until he gets his platelet count back to normal. Dawson asks Casey to be foster parents to Louie. Casey feels like they don't have enough time for a child right now. Otis tells Boden that his dad died from leukemia. He admits he's scared about his disease. Dawson tells Casey she is going to apply to be Louie's foster mom on her own. They get called to a fire at Molly's. The ice maker caused an electrical fire. The house gets the new masks. Dawson learns she will not be able to foster Louie. 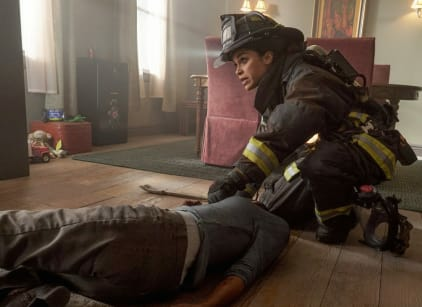 Severide helps Kidd repair the damage at Molly's. They end up making out. Kidd: What I am talking about is artisanal ice cubes. Look, Severide knows. Severide, you ever order a Scotch on the rocks and they bring you one, giant, perfectly clear ice cube? Kidd: So, it's pretty awesome right? Severide: Yeah, it keeps the drink cold, if that's what you mean. Permalink: Yeah, it keeps the drink cold, if that's what you mean. Cruz: I don't buy it. Otis gets a hang nail, he doesn't shut up about it for a week. This he says is nothing?